2013 the organization “Doctors without boarders” made an event with 12 actors of the group VAULT to pass on this message: “Million women don´t ask for our help, they die for it!”. The communistic union PAME made big demonstrations around in Greece. Also the headmaster of Athens, Giorgos Kaminis, told to open a new accomodation for mistreated women. 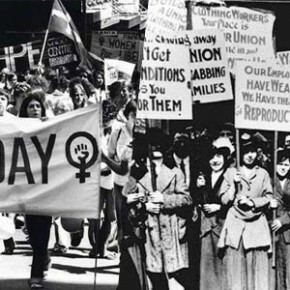 Also in Greek history many stories focused on women organisations,who fought together for their rights. 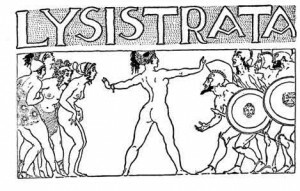 One comedy of the famous greek poet Aristophanes is Lysistrata (from Greek: Λυσιστράτη = Lysistrátē, λύσις = dispanding, and στρατός = army). It was performed in 411 BC in the 20th year of the Pelopponesian war. In the same year in Athens, aristocrats brought down the government of the radical Socialdemocratics. Lysistrata is the third pazifistic act of Aristophanes, with war as the main topic. The act focuses on the fight of women against men as causer of war and with that related suffers. Through this insight women from Athens and Sparta unite to obtain peace by force. They occupy under their leader Lysistrata the acropoly andrefuse themselves henceforth to sexual acts with their husbands. Moreover in Sparta the same happens under a woman, called Lampito. After some realizations and some retrogate steps, finally the revocation leads to success. Other ancient gathering of women where the “Thesmophoria”, a mysterical celebration in Athens and other places in Greece, that was made at the 11th, 12th and 13th day of the month Pyanopsion (October/November). It was organized in honor of Demeter Thesmophoros, the god of agriculture, society and the legitimate marriage. 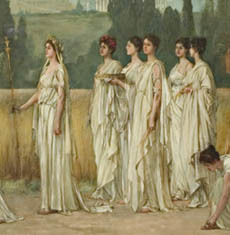 The focus of this celebration was a procession of women, close to the tempel of Demeter at the hill of Kolias. Included was a junketing with dances and games, where men were strongly excluded. In Athens this ritual happend on the Pnyx. For this event the men let the women have this important place, what shows the significance of this event for the whole community in that time. This entry was posted in Projects, Sustainable Development, Theory, W(e) DID Workshop, Women rights. Bookmark the permalink.